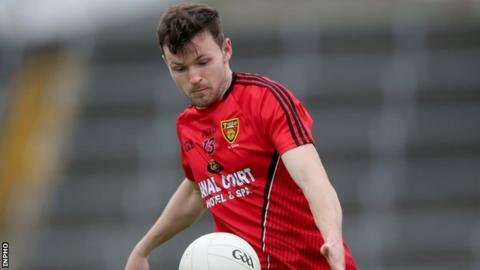 Substitute Cory Quinn scored two second-half goals as Down beat Offaly 2-12 to 0-10 to move above Louth to the top of Football League Division Three. Last week's hat-trick hero Donal O'Hare scored six points as the Mournemen made it four wins in a row and took a major step towards promotion to Division Two. Down, with the wind advantage in the first half, led 0-8 to 0-6 at the break at Pairc Esler in Newry. Bernard Allen top-scored for Offaly with six points, all from frees. Looking to return to Division Two at the first attempt, Down have now recovered from their opening day defeat at the hands of Laois by defeating Sligo, Westmeath, Longford and Offaly. Down and Louth, who lost 1-10 to 0-12 to Carlow on Saturday night, still occupy the two promotion places. The first half was evenly contested but having recorded five wides, Paddy Tally's men would have been disappointed to go in just two points to the good at the interval. Jerome Johnston had the best goal chance of the half for the hosts but Paul McConway made a fine save. Offaly lost Shane Horan, who scored his side's only points from play in the first half to injury, a major setback for the visitors. Down were dominant after the resumption and Quinn squeezed the ball low into the net after receiving O'Hare's pass in the 52nd minute to make it 1-10 to 0-7. Quinn scored his second goal two minutes into added time to leave eight points between the teams at the final whistle and Down two points clear at the top of the league. Laois saw off Longford 0-14 to 0-12 in Saturday evening's other Division Three fixture. Down scorers: O'Hare 0-6, Quinn 2-0, Mooney 0-2, McKernan 0-1, O'Hagan 0-1, Johnston 0-1, R Burns 0-1. Offaly scorers: Allen 0-6, Horan 0-2, Cunningham 0-1, McNamee 0-1.